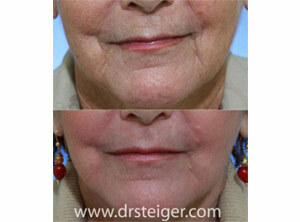 The CO2 laser is the gold standard for laser skin resurfacing in order to treat the effects of facial skin aging. The latest laser technology, the fractional CO2 laser, offers many of the benefits of the full face CO2 laser, with a fraction of the downtime. 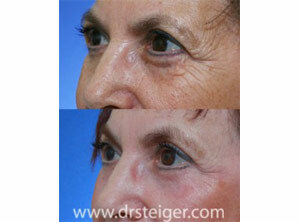 The laser is used to treat the effects of sun damage on the skin as well as facial skin aging. The laser can provide skin tightening, is used to treat dyschromia (brown spots and skin discoloration), even out the skin tone and color, remove fine lines and wrinkles, and to reduce the size of large pores. The laser is used to 1) improve the skin tone 2) improve the skin color 3) improve the texture of the skin 4) improve the appearance of fine lines and wrinkles. 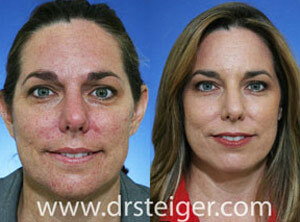 Depending on the desired results, as well as the type of skin you have; the laser settings will be determined by Dr. Steiger. The laser is then used sequentially applied to the skin of your face, neck, and/or chest. Fractional CO2 laser skin resurfacing can be performed in the comfort of our office under local anesthesia. A prescription will be given to you, to take prior to the procedure in order to help relax you. 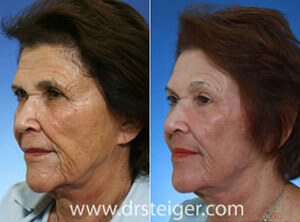 Alternatively, the laser can also be performed in the procedure room under IV sedation. The procedure takes approximately one hour to complete. You can go home immediately after your laser skin procedure. Specific instructions on how to take care of your skin both before and after the procedure will be given to you. It is important that you follow these instructions in order to obtain the best possible results. Over the next 3-5 days your skin will gently peel. During this time period you will keep the skin clean and moist with a vaseline type ointment. Once the skin is peeled, you can use make-up in order to cover any redness, if there is any. Dr. Jacob D Steiger MD is South Florida fractional CO2 laser expert board certified by the American Board of Facial Plastic and Reconstructive Surgery and the American Board of Otolaryngology- Head & Neck Surgery. He practices in Boca Raton and Delray Beach, Florida treating patients from Palm Beach, Ft. Lauderdale, Miami, as well as patients from all over the US and from around the world.